"The Big Band Sound was a great success! The gang did a WONDERFUL job playing on such a tight stage. After being asked to play softly, you did a perfect job quietly tearin’ the roof off of our auditorium! Your musical selections were so fitting for our Valentine’s Day tribute and the tidbits of musically historic information before each song really kept the audience intrigued. Dancing was found in the back of the room, the front of the room, and down the aisles! We can’t wait to have you back!" "It was a pleasure having your jazz band play at our event. You were the talk here for days. Everyone raved about the band, their talents and the songs that brought back so many memories. Each and every one of you have a unique talent. Everyone enjoyed meeting you and were amazed at how warm and personable each of you were. We sincerely thank you for sharing your time and talents with us. You made our evening a night to be remembered for a very long time. We really appreciate your visit and are looking forward to another sometime in the near future." "In one word.... WOW! You guys were wonderful! We thoroughly enjoyed your musical selections as well as the quality and professionalism of your performance. Many of the guests from a separate party downstairs insisted on poking their heads into my party to see where the wonderful music was coming from. Thank you for making our party a complete success!" "When I was planning a surprise 50th birthday party for my wife, I knew I wanted live music, but it had to be something special. I immediately thought of The Big Band Sound. I had heard them perform at outdoor concerts, but I didn't know if they would be willing perform at the size party I was planning (50 people, of all ages). I contacted Dave and we discussed the logistics, including a visit to the hall where the party was to take place. Dave was a pleasure to work with and was eager to accommodate my needs. The cost easily fit within my budget and was worth every penny. It was a thrilling experience for my guests (and a huge surprise for my wife) to be in the same room as a 19-piece swing band, especially one of the caliber of The Big Band Sound. The night of the party, and for weeks afterward, I heard nothing but favorable comments about the band from the people who were at the party. Thanks to The Big Band Sound for making a special occasion a memorable one as well! 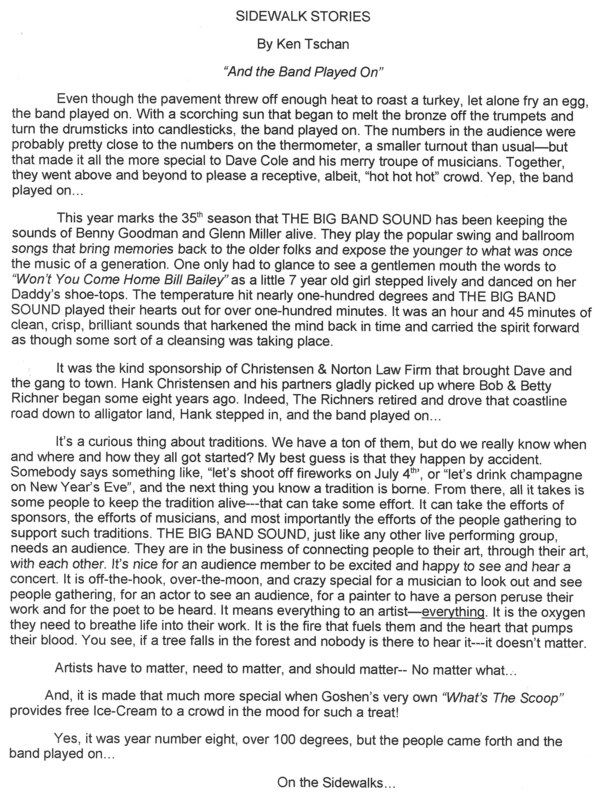 "The Big Band Sound is a wonderful band. They've been part of the Hudson Valley Summer Music Festival for the last three years and have always inspired the audience to ask for more. They are easy to work with and are very professional. People of all ages enjoy their performance, and that's why we keep bringing them back." "It is impossible to thank you enough for the great job The Big Band Sound did at our fundraiser! You are a very talented and professional orchestra and I am thrilled that you so generously performed for us. Your performance added the perfect touch of elegance to the evening!" "The Big Band Sound is the best big band around! All the cats and kittens were swinging tonight!" "What a fun evening! It was 1944 all over again! The Big Band Sound is awesome! You guys are the best!" "You have the best sound that I've heard in a long while! It brought back so many wonderful memories! The Big Band Sound made it a perfect evening!" "We had a ball! Such danceable music! Very professional and enjoyable!" "We were treated to some of the best music to be heard in the Hudson Valley! What a pleasure for dancing and listening!" "We had a great time dancing to the wonderful music of The Big Band Sound! It couldn't be better! Nothing beats swing!" "Way to go! You have great musicians and we love it! Keep the music rolling! Your vocalist had a wonderful, appealing voice and was a very personable announcer. We love The Big Band Sound!" "Thanks to a wonderful band! What tremendous musicianship and style! The best of the Hudson Valley!" "Thank you for making our evening such a wonderful success for our organization! Top-shelf!" "Great sound! Great music! Great memories! You guys are terrific!" "Great job by The Big Band Sound! You guys have an awesome sound! Keep on playing 'cause we need swing to come back even more. We haven't had such a great time in ages!" "The Big Band Sound was wonderful! You really got the crowd going. It was great to see and hear such a big band! Fantastic! (great singing by the entire band too!)" "Our sincere thanks for a great evening! I wish that you could have experienced the joy our residents got from your performance; for several days they talked about it with shining faces!" "We wish to thank you and all the performers in The Big Band Sound orchestra for coming to play for us. We had such fun dancing and listening to those familiar tunes. You brought back many happy memories." "Incredible! One of the finest big bands, right here in the Hudson Valley! This is what the big band era was all about! What a marvelous orchestra!" "Just wanted to compliment you and your ensemble for the wonderful job you did last Saturday! Your group did a bang up job! It was deja vue for sure for all of us older folks. Those days are gone forever, but they were re-lived for a short time last Saturday night thanks to y'all! Best wishes to you and the group - keep up the great work! That way the beautiful music of those days gone by will live forever!" "I would like to thank you and The Big Band Sound for another wonderful night of entertainment. You brought back many memories as we danced the night away!" "I want to thank you very much for the wonderful music you provided at our holiday party. It was a great pleasure for us hearing you play so many of the songs we all love so much and it brought back memories of days gone by. We really appreciate it." "All of the attendees had the best of compliments on your performance last week!! It was very much enjoyed by all!! You all are very talented and clearly enjoy performing as you do! Thank you!" "Smashing, Smashing, Smashing! The band was absolutely incredible. We can't thank you enough for everything. Your non-stop spirit was wonderful. People are still talking!" "I would like to thank you for an exceptional performance by The Big Band Sound! The combination of big band talent and a great vocalist brought back many pleasant memories." "I want to express my sincere thanks to The Big Band Sound for the wonderful performance you gave us. People will be talking about the performance for some time as the music was from our era and it brought back many memories. People had tears in their eyes as they talked of bands they had heard in the past. Thank you very much." "Thank you and your band members for a wonderful performance last week. Our guests loved it!" "I would like to take this opportunity to once again thank you and the members of your band for making our event so successful. Your professionalism with respect to your equipment, set-up, take-down, and performance was noticed and appreciated."